Last Wednesday was the final game of the 2014 softball league I play in. The MTA conspired against me and both the trains I took to the field were running late. I showed up to the field as the first inning was starting, running to our dugout in time for my teammates to tell me that I was next up to bat. I try to stretch my arms a bit before stepping up to the plate. I knew the team we were playing was undefeated, and since I was late I wanted a good look at what the pitcher was throwing. So I let the first ball fly past me. Hmmm, didn’t agree with that, but whatever. Deep breaths, Wilson. Wait for yours. “Strike 3!” I was out. I walk to the dugout and ask if I can play at second as I’m a bit ticked at the umpire and don’t want to play catcher and be in his proximity. The following inning, I did play catcher though, firmly resolved to not speak to this umpire. After two outs, one of the team’s best players comes up to bat. One strike. Two strike. Third pitch… he hits it foul. I extend my arm to my left and dive into the dirt, using my other hand to lock the ball in my mitt. “OUT!” I hear the roar of my teammates cheering for me, and I smugly think to myself, “How’s that, honey?” But I say nothing and jump around in excitement with my teammates telling me how proud they are. 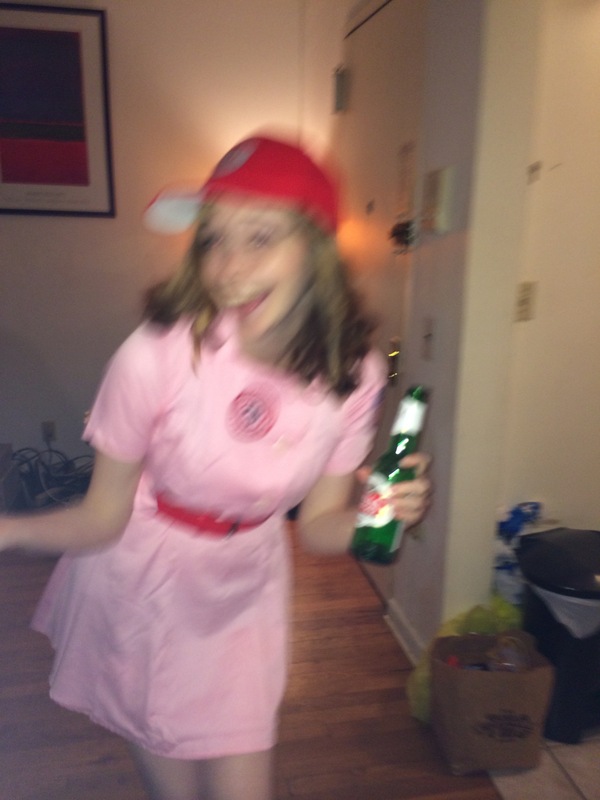 A couple of innings later, I’m back up to bat. I’m one and one at this point. After my questionable strikeout, I hit a good single. You see, I’ve been doing a lot of kickboxing lately. My body is stronger. My upper body, my core, my legs. I can feel the strength growing in them, and it feels amazing. My hitting has improved so much. I’m making good contact, and I finally finally have a wee bit of power behind my hits. So there I am. First pitch is a little high, but I swing and miss. I don’t turn around. I just face the pitcher and silently scream in my head. I don’t need this stranger to tell me how to bat. I don’t want him to tell me how to bat. All in all, I’m doing just fine on my own. I’ve gratefully accepted advice from friends, boyfriends, flings, first dates in the past, but all solicited, all with me starting the conversation of how I can improve my batting. This man doesn’t know me. Finally my pitch comes. I hit it hard. I make it to first, and in a perfect yet imaginary world I hit it like Ken Griffey Jr., running to first base with bravado, looking over my shoulder to say “Don’t ever call me sweetheart again.” But in the real world, I keep my chin up and run as hard as I can focusing on making it in plenty of time. Later at the bar, my teammates congratulate me on a good game. I tell them about the comments from the umpire, and they likewise respond with disgust. But they also claim that maybe a bit of that rage was good for me, they joke about calling me honey/sweetheart before every at bat. I laugh. But I’d prefer they not. Unless you’re someone I’m romantically involved with or you’re my mother or a good friend comforting me in a difficult time or someone who has earned that familiarity with me in some way or another, please don’t. When this situation happened to me a couple of days ago, I was mildly annoyed and uncomfortable, but the more I think about it, the more upset I become. And when I’ve told co-workers and friends the story, the look of horror on their face has made me realize how much worse the situation was than I realized. I’ve been sick. A week or so ago, my left submandibular lymph gland became swollen. Last weekend my ear started hurting…a lot. By Wednesday this week, I was sent home from work for “looking like death” and feeling dizzy and nauseous. By Thursday I decided it was time to see a doctor. I walked to an Urgent Care near my boyfriend’s apartment where I had been staying the night before. I was taken into a children’s exam room, walls covered with Toy Story stickers and sneaker scuff marks on the walls. A nurse look my vitals and asked me some questions about my ear pain. About five minutes later, a doctor walks in. He doesn’t introduce himself. He doesn’t even say hello. He walks up to me, stands about a foot from my face. “Your eyes are puffy,” he says to me. “I know. I’ve had them since childhood. That’s not why I’m here.” He lifts his hand to my face and runs his fingers along the skin under my eyes. I sit there silently, confused as to why he’s talking about this. He goes on for the next 5-10 minutes telling me about different products from Clinique that he has used and that I should use. All I can think about is how much pain I’m in and how all I want is a prescription to fix it, some advice on what I can do to make it better. “No, your eyes!” he interrupts me. I sit there feeling awkward, reminding myself in my head that at least my boyfriend thinks I’m pretty. It can’t be all that bad. He comes back over and uses his stethoscope to listen to me breath. “Well I think you have a throat infection. I’m going to give you an antibiotic, take some advil, and you’ll need more vitamin C this winter. Oh, and get plenty of sleep. I’m not going to see you in the club at 4am tonight, am I?” He turns to me and smiles. “I don’t go to clubs.” I mentally decide I hate this man. I follow him to his office where he writes up the prescription. THEN, he goes on the Clinique website and starts showing me the products he thinks I should use. I’m not paying attention. All I want is my prescription so I can start taking care of the ear that is throbbing with pain. “Can I just have my prescriptions?” I say coldly. Three days later. I don’t feel better. My ear is throbbing. I get out of the subway after work to go to a different urgent care. I walk by this one and see him standing outside. I’m so furious. I’m also incredulous at how unprofessional the whole experience was. How dare he critique my appearance? I rolled out of bed and went to a doctor’s office in pain, not to have my makeup criticized. I wish I’d said something. People always ask me if my job is sad, or if it is hard to deal with the losses. It is. There’s no doubt in that. But most of the time, the animals are sick, tired, old, and they are ready to go. It feels natural. But last Saturday, one of the cases we saw really got to me, and I haven’t been able to stop thinking about it. We had a new puppy visit, a dog who had been picked up from the breeder the day before. Usually, these are happy appointments. Who doesn’t love an awkward and cheerful puppy? They jump all over you, they squirm, they get a confused look on their face when we take their temperature for the first time. This puppy visit was a doberman. Doberman puppies are adorable. They have massive, club-like paws and soft muzzles. Unfortunately, they are often wearing the funny hats pictured above. 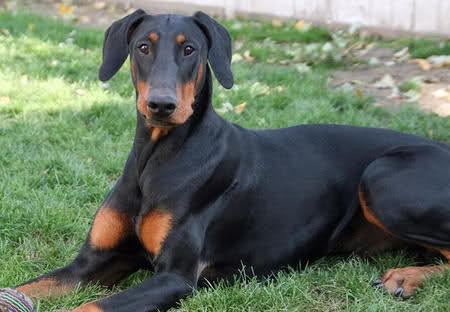 Dobermans were originally bred to be guard and attack dogs. Owners started cropping their ears, so that attackers wouldn’t be able to grab onto them during an attack. Since then, it has become an AKC (American Kennel Club) standard for the breed. So the snobs of the world insist on keeping the tradition alive for appearances sake. 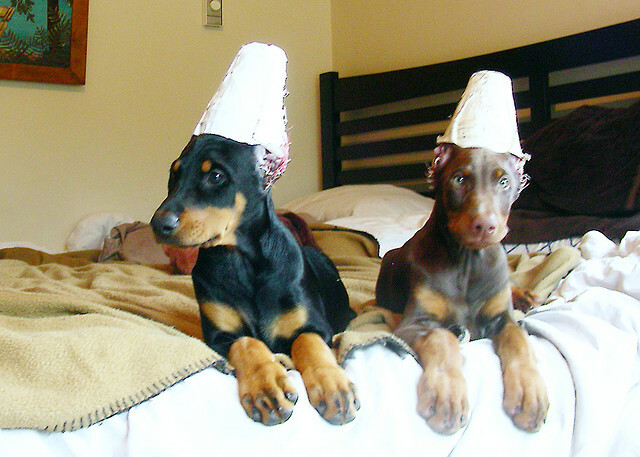 So nowadays, at the tender age of 7-12 weeks, doberman puppies (this is done in a couple of other breeds as well) are taken to a vet to have 2/3 of their naturally floppy ears cut off, stitched up, and taped to a Styrofoam cup on their heads. This is in hopes that their ears will eventually stand up on their own. If they don’t, further surgery is required. Again, let me reiterate that this is done for purely aesthetic reasons to comply with what the AKC says a doberman should look like. So on Saturday, I held the sweet Doberman puppy while Dr. R cleaned the pus from the ear wounds and tried to remove the tape as gently as possible. The puppy screamed in pain and wiggled in my arms. It broke my heart. Hearing a puppy cry is always a sad, sad moment. But this stung especially, because it was so unnecessary. Dr. R explained to me that it is all because of the AKC’s standards and that most vets refuse to do the ear cropping procedure, herself included. It is even illegal in many European countries. It’s so senseless. I brought the newly bandaged puppy back to her owner. She was texting away on her iphone. She had a Louis Vuitton purse on the chair next to her. And I was bringing her back her newest accessory. Of course, it wasn’t my place to say anything. But all I really wanted to know was, aren’t floppy ears just as adorable? Isn’t this just as fashionable?